The kitchen is where you plan and prepare your meals, have a quick cup of coffee, or grab a quick snack. We often spend quite a significant amount of time in our kitchens. It is a work area, and the kitchen benchtop is where most of the work is done. Modern kitchen benchtops need to be strong and durable, and at the same time be great to look at. It is part of your kitchen’s décor and often the centerpiece of the room. There are many options available to you. 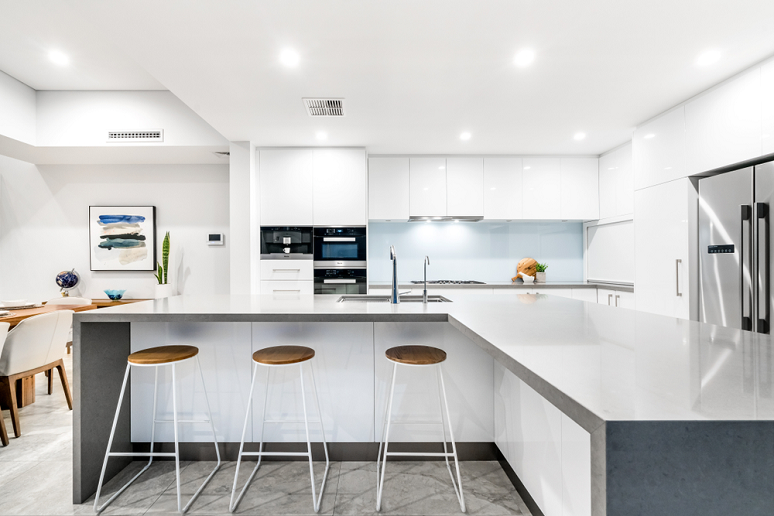 Let us take a look at what factors you need to consider and the different types of modern benchtops available out there. Budget: Some materials cost more than others because of high demand, less availability, and practical reasons. You will need to think about how much you want to spend on modern kitchen benchtops. Your budget will decide which material you can use. Appearance: The look and feel of the benchtop is a major factor in influencing buyers. When a product looks really appealing, people don’t mind paying a little extra for it. Remember that your benchtop should complement the rest of your kitchen and you don’t want a cheap countertop in an otherwise expensive looking room. Practicality: Since modern benchtops are used for meal preparation in the kitchens, durability is an important factor while selecting one. 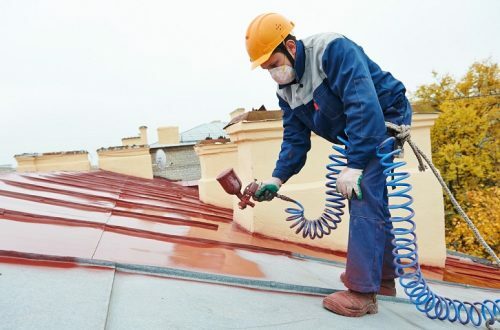 You also need to consider how easy it is to clean and maintain. Bamboo and butcher block: If you want a rustic look for your kitchen, bamboo and butcher block is the right option for you. Bamboo is environment friendly and is not very expensive. Modern kitchen benchtops made from bamboo can be sealed with oil or polyurethane. If you have an oiled finish, remember that you will need to apply the oil from time to time so that the benchtop does not dry and crack. Clean spills with a damp cloth for oiled finishes, and use warm soapy water or wiping products for polyurethane finishes. Do not use harsh cleaners as they will damage the surface and remove the gloss. Polished concrete: If you want an industrial look, a polished concrete benchtop is a way to go. 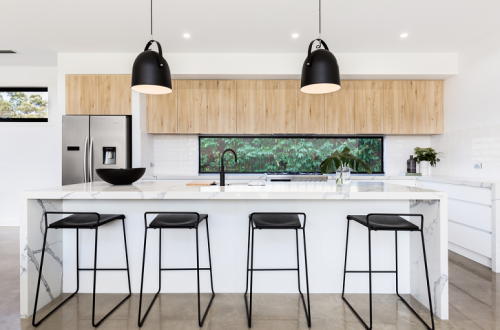 Modern benchtops made of polished concrete can be expensive. 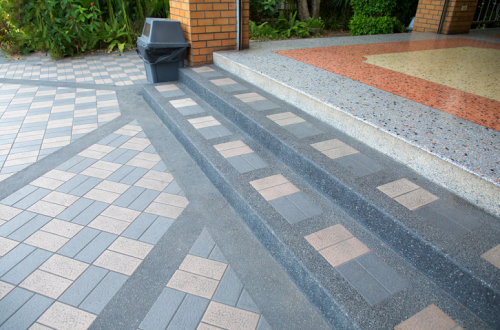 The color is decided by cement, aggregate and sand, creating a unique and modern look. Because concrete is porous, it will need to be sealed or polished for durability. Sealed granite: If budget is not a constraint and you are willing to go all out for your kitchen, then natural granite is a great choice. It is very durable and will last you a lifetime. Laminate: For people on tight budgets, laminate is the low-cost option for modern kitchen benchtops. Laminate is made from layers of paper over a chipboard, plywood, or MDF board. There are different styles available like woodgrain, marble, or granite. Marble: A top-range option for homeowners, marble is a natural stone. It is delicate and needs to be maintained properly. Marble is more porous than granite, and therefore, periodic sealing and maintenance are necessary. There are other materials like porcelain, quartz, stainless steel, tiles, and so on that can be used to make modern kitchen benchtops. Once you make your selection and install it in your kitchen, make sure to take good care of it so that it lasts for a long time and does not need replacement Select a right manufacturer for modern kitchen benchtop who offers the warranty on the product and has good after-sales support. With the right care and maintenance, modern benchtops can be a great addition to that very important room in the house the kitchen!